Joy Madison, a graduating senior, will be receiving a degree in marketing with a minor in advertising. “I am beyond excited to graduate,” said Madison, who added that she is the first female in her family to graduate. Madison decided to go to Southern Illinois University four years ago and has been an involved student ever since. She was president of the Women’s Business association; program chair and executive secretary for the Black Affairs Council; a member of the Black Women’s Taskforce; and a member of several other registered student organizations. Madison’s hard work and involvement won’t stop after graduation, either. She plans on continuing her education to obtain her master’s degree. Mahlon Lee Rich, a senior accounting major, is another one of the many College of Business students who is graduating this semester. “The College of Business has a strong focus on building students’ skills to prepare them for work post-graduation,” Rich said. Rich recently was named the Most Outstanding Senior in Accounting at the Honors Day Ceremony, which took place in April. “It was a real honor, and something I never expected to receive,” Rich said. He plans to continue his education and enroll in the Masters of Accountancy degree program this fall. Another notable graduating student is Jennifer Goodart, who came from Texas Tech to enter the Masters of Accountancy degree program. Her upcoming plans involve working for PricewaterhouseCoopers in the St. Louis office as an assurance associate. “I’m grateful to have had the opportunity to further my education, and it is nice to see that hard work pays off,” Goodart said. 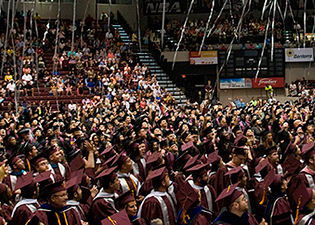 Commencement will take place at 1:30 p.m. Saturday, May 16, in the SIU Arena. The ceremony will recognize an estimated 111 undergraduate students, 57 graduate students and one Ph.D. student as new graduates from the College of Business. Bruce Rauner, the 42nd governor of Illinois, will be delivering the keynote address at the ceremony. The College of Business wishes the best of luck to all of the students as they prepare to graduate and pursue their dreams.